You can't have a smart city without having smart security solutions in place to protect its residents and businesses, experts at Intersec noted, adding that investments in physical and IT security across the Middle East region is on the rise. According to Gartner, worldwide security spending will reach $96 billion in 2018, up eight per cent from 2017. In addition, spending on information security technology and services in the Middle East and North Africa (Mena) region was estimated to have reached $1.8 billion in 2017, an increase of 11 per cent over 2016. Experts believe that this increase in spending by organisations is to mitigate new risks that traditional information security practices are not accustomed to. 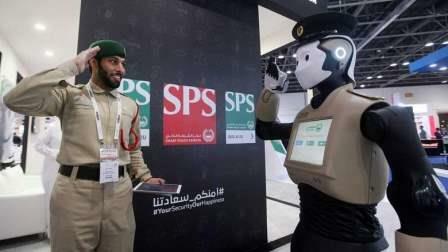 Security solutions took the centrestage on Sunday at the Intersec 2018 exhibition. Inaugurated by Sheikh Mansoor bin Mohammed bin Rashid Al Maktoum, the 20th edition of the show features 1,337 exhibitors from 59 countries. Experts noted that physical security solutions such as intruder alarms, video surveillance, electronic locks, perimeter protection, door alarms, access control protocols and identification systems are in high demand, while the rise of IoT will mean an increase in smarter and networked systems available in the market. According to Frost & Sullivan, the intensity of investment is expected to peak during the next two years toward 2020, when spending on physical security will reach $10.2 billion, comprising 10 per cent of the global market. When it comes to the commercial security market, Frost & Sullivan estimates the market to be worth $4.8 billion by 2021, growing at a 17 per cent compound annual growth rate from its $2.2 billion value in 2016. Video surveillance accounts for a 75 per cent of total market share, followed by access control at 15 per cent, and intrusion detection at 10 per cent. Saudi Arabia and the UAE together comprise more than half of the entire regional market. "One of the things that we are increasingly focusing on is building a smart and safe city," said Hazem Bazan, vice-president of channels and commercial sales at Huawei Enterprise Middle East. "We are looking at launching solutions that are built on the pillars of technology such as Artificial Intelligence (AI), the cloud, and the Internet of Things (IoT)." Huawei was participating at Intersec to showcase its Safe Campus suite of solutions, which are aimed at enhancing public safety in the region. Safe Campus is an end-to-end ICT solution that may be deployed in buildings, office spaces, stadiums, schools, hotels, and many more scenarios to assist in incident prevention, emergency response, and evidence collection. As a key enabler of the Middle East's ongoing digital transformation, Huawei has partnered with several civil authorities in the region to improve the effectiveness and efficiency of law enforcement, and help to ensure a safe environment for the public. "The solutions that we are offering can be tailored to suit the scenario that they are being deployed in," Bazan said. "The whole idea is to implement measures that will ensure a safe city, where issues are prevented before they can happen." The Middle East homeland security market, which includes monitoring and surveillance systems, restricted entry systems, and perimeter security solutions, is expected to more than double in five years, growing from $9.6 billion in 2017 to $19.7 billion by 2022, according to recent data from Frost & Sullivan. Saudi Arabia continues to be the largest homeland security market, with 44.8 per cent of the total market, followed by the UAE with 16.6 per cent. "There are several Dubai Government entities that are adopting new technologies in their journey to make Dubai a smart city," said Mansoor Bu Osaiba, CEO of Nedaa. "These include autonomous vehicles, airborne taxis, and delivery drones. All of these require a private network that caters to their applications and Nedaa is there to aid them with its LTE and 5G networks and coverage." Nedaa is participating at the exhibition to demonstrate its LTE and 5G use cases of private network capabilities that allow different organisations to deploy smart and safe applications, and provide an overall better city experience. Nedaa is also demonstrating the use of LTE-connected drones to facilitate efficiency in rescuing operations for first responders. Airbus, one of the featured partners of Nedaa, was also showcasing its capabilities to integrate with multi-vendor LTE in a safe and secure way, which allows the grouping of smartphones and Tetra radios under one cluster. "We want to highlight the security aspect of IoT," says Mustapha El Baba, deputy head of sales for the Mena region at Airbus Defense and Space. "Our concern is to have the flow of data in a very secure and encrypted way. We are using a very secure means of transporting the data." "With reference to smart cities and IoT, we see a massive explosion of data," says Steve Jones, sales engineer, surveillance, at Seagate. "All this data needs to be safely and properly secured, and one of the ways that this needs to be done is through proper education. Data today is at risk, and security is always a major concern." Seagate was exhibiting its surveillance storage technologies, with demonstrations of its SkyHawk, SkyHawk AI and Exos X12 products and solutions from partners Hikvision and Dahua.